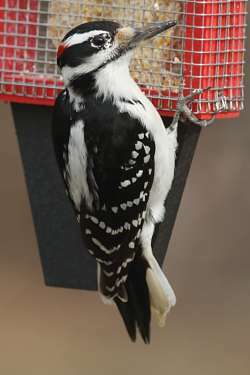 The hairy woodpecker is one of the most popular backyard birds in North America. Its name comes from the long whitish feathers in the middle of its back, surrounded by black feathers with white speckles. The hairy woodpecker is the best known of all woodpeckers because it comes readily to feeders, so it is easy to observe. A hairy woodpecker is about the size of a robin, just under 10 inches in length and has a 15-inch wingspan. The female hairy woodpecker has less white on the wings compared to its male counterpart, but both have a white bar above and below the eyes. A fully developed male hairy woodpecker also has a red patch on the back of its head, but this patch is closer to orange than red in younger males. The hairy woodpecker is larger than the downy woodpecker and the bill is as large as its head, whereas the Downy’s is much smaller. The outer tail feathers are also completely white. The hairy woodpecker has a distinct black mark that looks like a comma from its shoulder to the breast, and its beak is as long as its head. These two features allow you to tell the difference between a hairy and a downy woodpecker, which is very similar in appearance but has a shorter beak and a less visible black fleck on its shoulder. The downy woodpecker is also smaller than the hairy and has fleckled outer tail feathers, whereas those of the hairy woodpecker are fully white. The hairy woodpecker is a forest bird, and it usually prefers pine trees and other deciduous forests. It’s also quite widespread and can be found all the way from Canada to Mexico. It also makes its home in the Turks and Caicos Islands, Panama, El Salvador, Costa Rica and Puerto Rico. More specifically, the hairy woodpecker loves living in mature woodlands, as well as at the sites of recent forest fires. 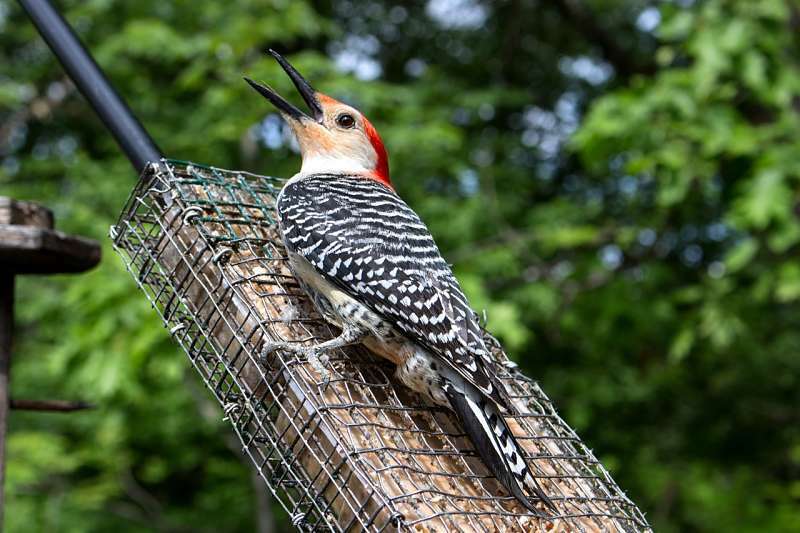 It also ventures into more urban habitats in search of suet, so you can set up a bird seeder and sure enough, the hairy woodpecker will make an appearance. Hairy woodpeckers like to set up permanent homes wherever they settle, so they hardly migrate and can be seen all year round. However, hairy woodpeckers that live in mountainous areas might move lower, or those in the extreme northern environments may move south to escape bitter winters. But hairy woodpeckers tend to be quite shy when they’re in their forest habitats and away from bird feeders, so if you’re looking to observe them in the wild, have a good pair of binoculars with you! As of 2003, the hairy woodpecker population was estimated at over nine million individuals, and all trends since then show that this population is steadily growing. The International Union for Conservation of Nature, or the IUCN, lists the hairy woodpecker as a “species of least concern in North America,” but like all bird species, they are threatened by deforestation. When trees are cut down, it also means there is greater competition among the birds for food and shelter, and one of the biggest threats to the hairy woodpecker is the European starling, which also likes to make its nests in the same habitats as the hairy woodpecker. The hairy woodpecker loves finding beetles that live inside trees, and its tough, chisel-like beak can get right into the bark and find the larvae underneath. Hairy woodpeckers also eat caterpillars, flies, spiders, grasshoppers, ants, cockroaches and beetles, which means they’re very helpful to farmers because they eat the critters that can destroy crops and orchards, such as the corn-boring moth which is a huge threat to corn crops in the U.S. today. Hairy woodpeckers also help to keep our forests and shade trees in good shape because they eat up all the insects that could potentially cause the trees harm. These speckled birds also eat sunflower seeds, nuts, peanut butter and suet, so keep these in your bird feeders and hairy woodpeckers will come to feast. They also have a sweet tooth: Hairy woodpeckers have been seen to peck at sugarcanes and lick up the sweet juice with its long tongue. But they rarely eat berries or wild fruits, so avoid putting these in your bird feeders. Hairy woodpeckers tend to be monogamous, and they stay with their mate for about four years. This is why hairy woodpeckers are often found in pairs. The search for a birdie spouse typically starts in the late fall, three months before nesting. Once they’ve paired up, hairy woodpeckers build a nest together inside a dead tree trunk. This takes from one to three weeks, and the nest is on average 20 feet off the ground, about two inches on the opening, and 10 inches deep. Hairy woodpeckers usually lay about four to five white eggs, and both the male and female hairy woodpeckers watch over their eggs for about 11 or 12 days until they hatch. The chicks hatch naked, that is, without any feathers, but they have a red patch on their foreheads. Their parents take turns in feeding them until the chicks leave their nests after about a month. The chicks stay dependent on their parents for food and shelter for several weeks more, until their turn comes to forage for themselves. Its song can be described as whiney, but with a more constant pitch, unlike the very similar downy woodpecker’s song which descends in pitch. A hairy woodpecker also makes a kind of drumming sound similar to a rolling drum, which imitates the sound of tapping wood. When it makes this sound while actually tapping on a hollow branch or a chimney, the sound becomes even louder. This is how the hairy woodpecker announces its territory and warns others to stay away. But when other woodpeckers don’t pay attention, the hairy woodpecker will raise its head straight up, raise its wings, and make an even more piercing cry. Trespassers beware! You can listen to examples of the hairy woodpecker call sound here. The hairy woodpecker is a fascinating bird, and one of the easiest to spot in your backyard. Keep a fresh supply of seeds and nuts in your feeder and wait for the hairy woodpecker, and most likely its mate too, to pay you a visit! Hey Buddy!, I found this information for you: "The Hairy Woodpecker". Here is the website link: http://backyardbirdingblog.com/hairy-woodpecker/. Thank you.